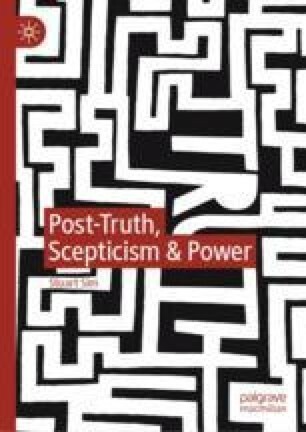 We need to understand how post-truth works, and its insidious role in human relations, so Chapter 2 begins the process with a survey of what the landscape of post-truth currently looks like, and the effect it is having on key areas of human affairs. The nature of the post-truth mentality is explored, emphasising its dogmatic character and bias towards prejudice; as well as its commitment to what has been called a ‘politics of againstness’, which foments social division. It can be seen at work in the actions of such prominent public figures as President Trump and his dismissal of all criticism as ‘fake news’. The fake news industry and the influence this is exerting on international politics is discussed, as is the difficulty in pinning down exactly how to define fake news or post-truth such that action can be taken against them. Kleinman, Zoe, ‘“Fake News Travels Faster”, Study Finds’, BBC News (9 March 2018), www.bbc.co.uk/news/technology-43344256 (accessed 14 March 2018). Pattterson, John, ‘For Haters Only: Watching Steve Bannon’s Documentary Films’, The Guardian (29 November 2016), www.theguardian.com/us-news/2016/nov/29/steve-bannon (accessed 27 September 2017). ‘US “Fake News” Kingpin Paul Horner Found Dead at 38’, BBC News (27 September 2017), www.bbc.co.uk/news/world-us-canada-4142287 (accessed 29 May 2018).